My sixteen year old Quaker loves these snacks and they are so much better for him than human snacks. Q: Wouldn't shortening be bad for birds since it's hydrogenated oil ? A: Donna -- others can certainly chime in and answer your question, but I have not heard anything about the use of shortenings in bird foods. My guess is that even if they are harmful to birds, which we do not know, the levels presented in your bird's diet would be minimal. 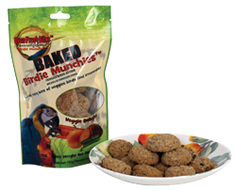 The question would be good to ask your avian vet and to weight any supposed risks versus the benefits of other ingredients in the treats.